Reviewers can’t seem to get enough of Middleton’s Double Vision. Laudatory comments come from such respectable outlets as The Wall Street Journal, Booklist, Publishers Weekly, and Kirkus. The modern art world is abuzz with compliments. And this New York Journal of Books review will be no less enthusiastic. John (Jean) de Menil (1904–1973) and Dominique (Schlumberger) de Menil (1908–1997) were essentially a power couple. They were perennially involved in business, civic, spiritual and artistic undertakings. And they generously sponsored an endless list of institutions, programs and individuals. This is the story of the family that has been defined as “The Medici of Modern Art.” Fully aware of their privileged position, they did not hold back their resources, but pursued a specific path with conscientiousness and intension. Their nonstop sophisticated intensity stretched from Paris to New York to Houston and their impact on each city is a lasting legacy. Born into impressive genealogical lineages that were “intellectual and moral dynasties” of France, both Dominique and John have well-established family histories dating prior to the Napoleonic era. In fact, both families served Napoleon in one fashion or another. Dominique’s quote, “There was a family tradition of continuity, idealism, and engagement,” seems equally suitable to both families. Whereas the Schlumberger family maintained their vast fortune, aristocratic circle, and elevated social status throughout the centuries, the de Menil name faltered from its pedestal. By the time he met Dominique, John de Menil possessed an aristocratic stature and the title of Baron, but not the backing of a family fortune. John de Menil had to work hard for his own living. In 1930 John and Dominique’s relationship had gotten quite serious and they were able to negotiate a marriage in 1931. They moved into the upper floors of a Paris apartment that Dominique’s father presented to them as a wedding present. Room by room they began what would be the first of a lifetime of renovation and building projects. They also purchased their first works of art: a Russian Orthodox icon and Christian Bérard’s Othello. Over the next 40-plus years the couple would add to their collection (upwards of 10,000 items) from a wide variety of periods, styles, and mediums. Prehistoric artifacts, African sculptures, Surrealist and Modernist paintings, were all alluring to the de Menils. Not only were they avid collectors, they were dedicated activists focused on promoting the artists, the ideals, and the causes that were important to them. John de Menil may have been a charismatic leader and successful businessman, but that did not imply that Dominique would be a sweet, quite, demure, uninvolved housewife. On the contrary, Dominique continued well after John’s death being an integral and engaged force in many arenas beyond the Schlumberger corporation and the various fine art institutions. She tackled complex ecumenical ignorances, local civil rights injustices and international human rights issues, even joining forces at one point with President Jimmy Carter. Her range of prestigious accomplishments is remarkable, unprecedented, and for most of us, truly unfathomable. All of this, and plenty more, is covered with finesse in Double Vision. This dual biography contains world history, personal antidotes, insightful quotes, letters, and a who’s who of top architects, painters, sculptors, and museum experts of the time. Great care is taken in the 100 pages of detailed acknowledgements, notes and index; the only useful item missing is a visual family tree, which would have been exceedingly helpful in the early parts of the genealogical discussions. 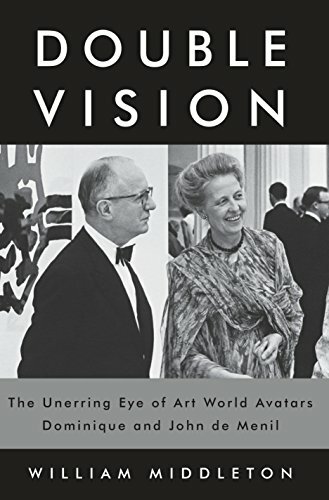 The cover blurb could not have made a better statement: “Middleton’s brilliant portrait of Dominique and John de Menil is an intimate and never-before-told story of two of the most important philanthropists of the 20th century, whose prescient vision for art and architecture, as well as for human rights, put them in a league of their own.” Once finished enjoying this book, the reader will no doubt echo this sentiment.